Prized in China and Asia for generations, jade is a unique and magical gemstone with some of the loveliest colors and properties of any gem. Jade - specifically the Jadeite mineral (and not Nephrite or other gems known as jade), can trace it's usage, both as tools, and adornments back thousands of years. When jade is found, it looks generally like a standard rock with what's called a "skin," or outer rough surface. In order to get to the more beautiful material it needs to be sliced up into sections. From looking at the boulder of jade it's hard to know what will be inside. Merchants and traders crack or slice small windows into the jade to take a peek, though it's only the smallest window into what lies within the rock. Jade comes in a variety of qualities and colors, of which many varieties may exist within one boulder. That's why valuing rough jade becomes so hard. Sometimes buyers will see a window of rich high quality color, only to slice the stone and find lower quality inside. Sometimes the windows do not show that there is a rich quality within. 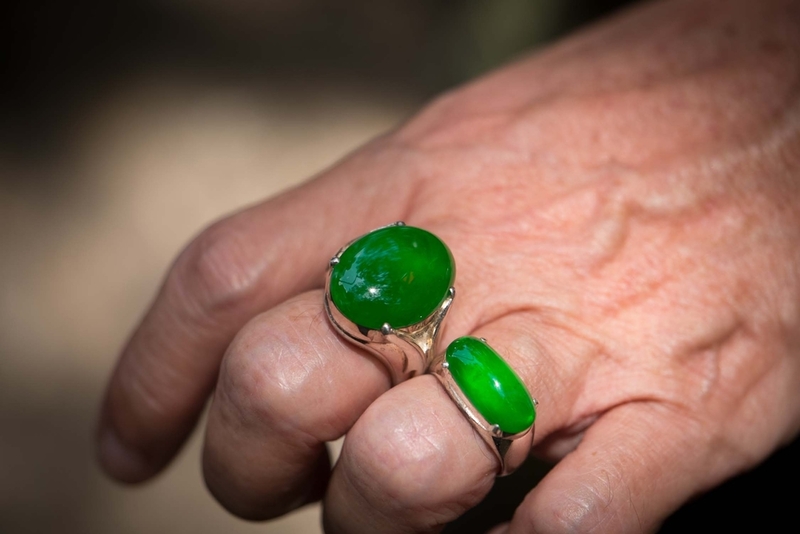 Jade rough buyers are often risk takers, and it makes for an exciting aspect of the business. Jade can be judged on both transparency and color. 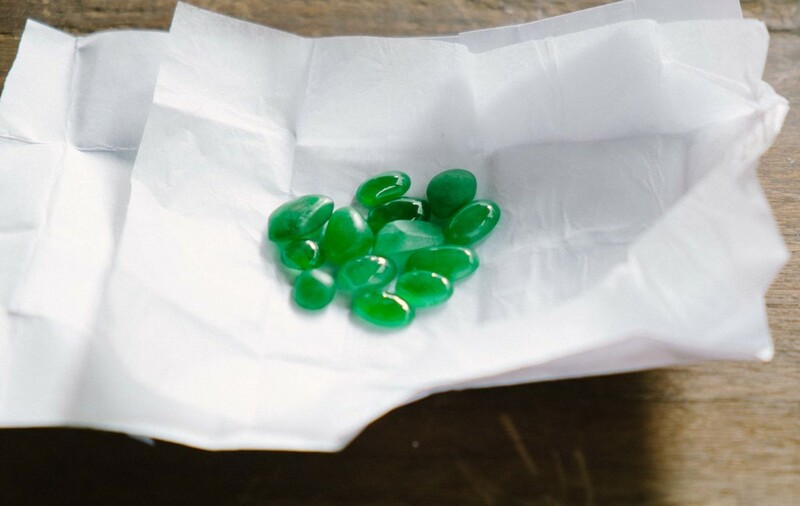 There are a few basic colors in Jade, the most valuable is the rich apple near emerald green, known as imperial jade. It also come in white and clear (colorless), Mauve (lavender), black, and red/orange. Combining richer colors, with higher transparency gives the greatest amount of value with many imperial jade pieces going for hundreds of thousands of dollars and more. Below are some varieties of Jadite Jade from Myanmar - known for having the highest quality jade in the world. Pair of high quality white jade pieces. Medium quality imperial jade, a mix of both rough and cut. Slices of lower quality carving jade. 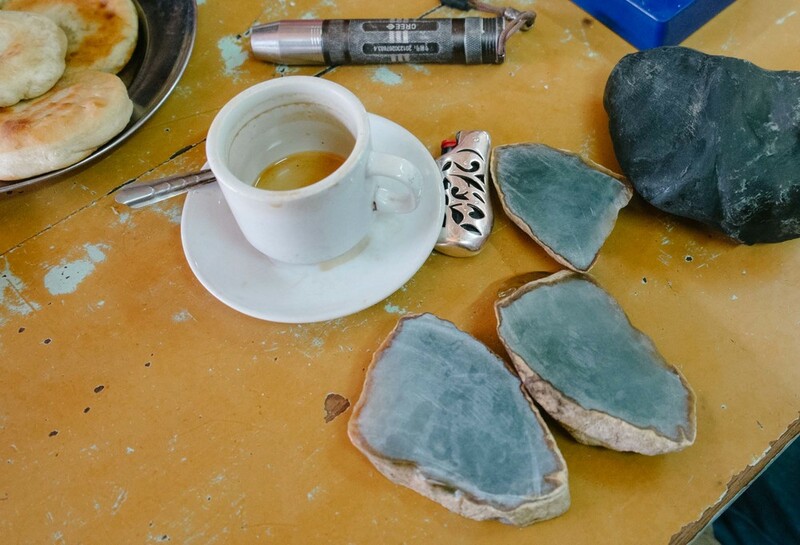 Shaping a rough jade piece with a hand grinder. Shaping by hand is more accurate than with machine, as it's slower.